Home is your portal to what’s currently happening around Player.me. What’s New - Shows Player.me’s latest overlays. Clicking the Add to overlays will add it to your current roster of overlays. Recent Streaming Events - Displays events from your currently connected linked service, useful for checking historical follows, subs, hosts. Clicking the Filter icon will allow you to select the Service Type or Event Type. For a more detailed list of your streaming events, you can go to the Dashboards tab. Live Now - Shows a list of ongoing streams within the Player community. 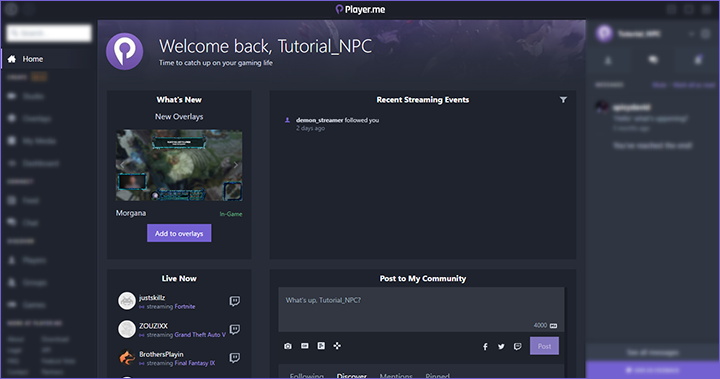 Post to My Community - A mini-version of your Feed: allows you to post updates and interact with the Player community. Achievements - Shows the Achievements you’ve earned with Player as well as your progress for upcoming ones. Player Motivation - Quotes from history’s famous people to help you get your game on. Discover Games -Suggests games for you to check out. Player Suggestions - Suggests users for you to check out or follow. Clicking the X icon will remove the Player from your suggestions. Clicking the Follow icon will follow the Player, and any posts they make will be added to your Followings feed. Group Suggestion - Recommends groups for you to check out. Clicking the X icon will remove the group from your suggestions. Clicking the Follow icon will follow the group, and any posts they make will be added to your Followings feed.